Editor's note: This story originally ran on September 29, before Stanton won the 2017 National League MVP Award. In the Year of the Home Run, we've had more players reach the five-, 10- and 20-home run levels than ever. But no one clouted, slugged or smashed more dingers than Giancarlo Stanton. The Miami Marlins right fielder sent 59 home runs screaming over fences across the majors, one shy of Babe Ruth's 60 in 1927 for eighth most in a season. We take a look at the where, the when and the "Wow! How far was that?" of the Great Stantino's stellar season. As you see in the animation above, Stanton has power to all fields. He has hit 22 homers (37.3 percent of his season total) to center, right-center or right field. Home runs Nos. 58 and 59 on Thursday night, however, were blasted to left center and left. His second homer, which seemed to disapparate, had an exit velocity of 118.7 mph, his highest on any home run this season, according to Statcast. It was the 10th time this season Stanton had multiple homers in a game, the most, according to ESPN Stats & Information, since Albert Pujols had 10 multihomer games in 2009. Only Hank Greenberg in 1938 and Sammy Sosa in 1998 had more multihomer games, 11 each. How far did they fly? Cheapies? There have been a few, like his 46th of the season, a 346-footer -- his shortest of the season -- at Citizens Bank Park. 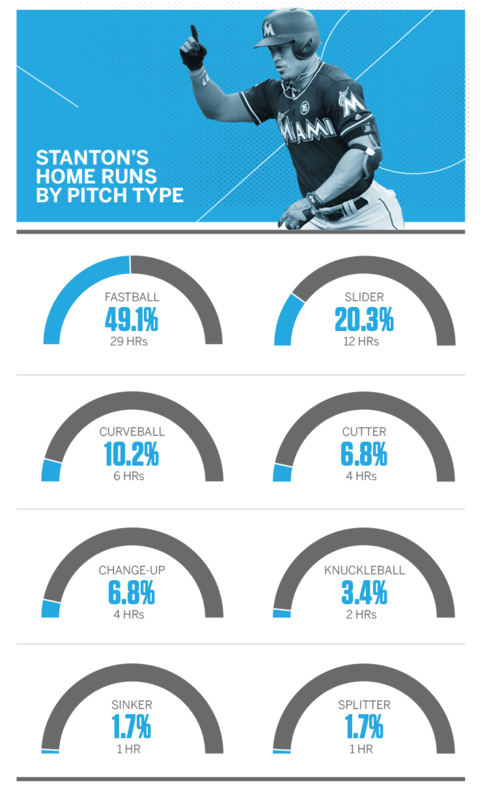 He has hit 4.67 miles worth of home runs, which adds up to a lot of florid 75-foot sculptures in left-center field at Marlins Park -- when stacked end on end. The only other slugger within a literal mile of Stanton is Aaron Judge, who is a little less than 4,000 feet behind this season. When did he do the most damage? If you fire up thesaurus.com and plug in "august," here are some of the synonyms: grand, brilliant, glorious, impressive, majestic, magnificent -- and highfalutin'. 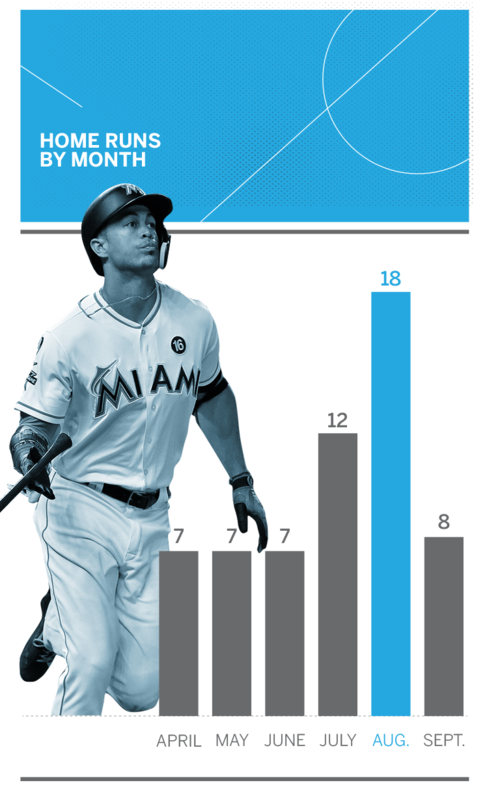 Stanton's August was all of that, as he went on a majestic tear, hitting 18 that month -- driving in 29 on those HRs and 36 total -- in a 25-day span. From Aug. 4-29, Stanton hit a homer every 5.2 at-bats with an average exit velocity of 107.9 mph, totaling 7,556 feet off 16 different pitchers, including Dickey and Travis Wood twice each, Max Scherzer, Madison Bumgarner and Aaron Nola. Coincidentally, Stanton hit his "softest" homer of the season -- a 95.1 mph shot off the Giants' Ty Blach on Aug. 14 -- during this stretch. Stanton has hit his homers off a wide array of pitchers this season: 51. Of those 51, he homered off eight pitchers twice. He has hit homers off 15 opponents, with the most -- eight each -- against the Phillies, Mets and Braves, with six more coming against the Nationals and Padres. But the homer with the biggest win-probability swing? That came at home against the Mets on April 15 with two out and the game tied at 4 in the bottom of the eighth. Stanton crushed a belt-high, 3-2 fastball from Fernando Salas that left a vapor trail and crashed into the foliage above the center-field wall. Stanton's homer increased the Marlins' win probability .322. It held, as the Marlins won 5-4, thanks to Stanton's solo shot. What pitches did he hit? 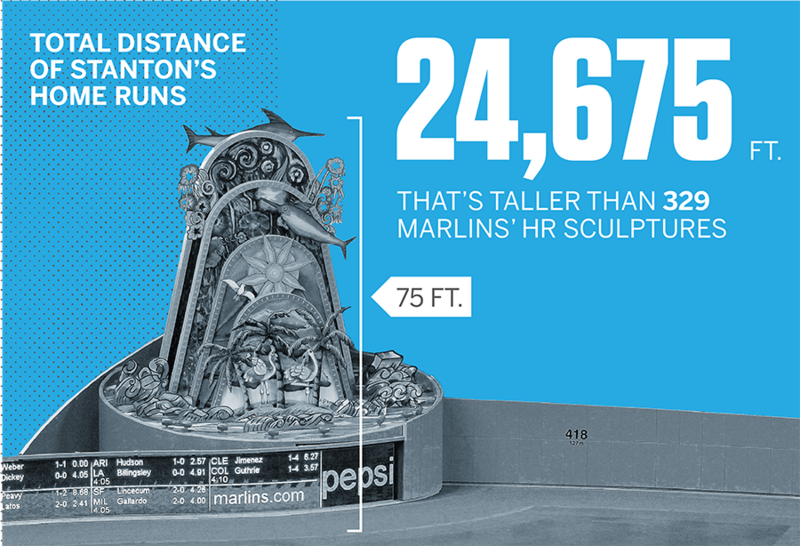 Stanton has set off the sculpture at Marlins Park 31 times and has hit 28 homers in 11 other MLB parks, with Citi Field, Nationals Park and SunTrust Field as his favorite homes away from home, ripping four dingers apiece at each park. 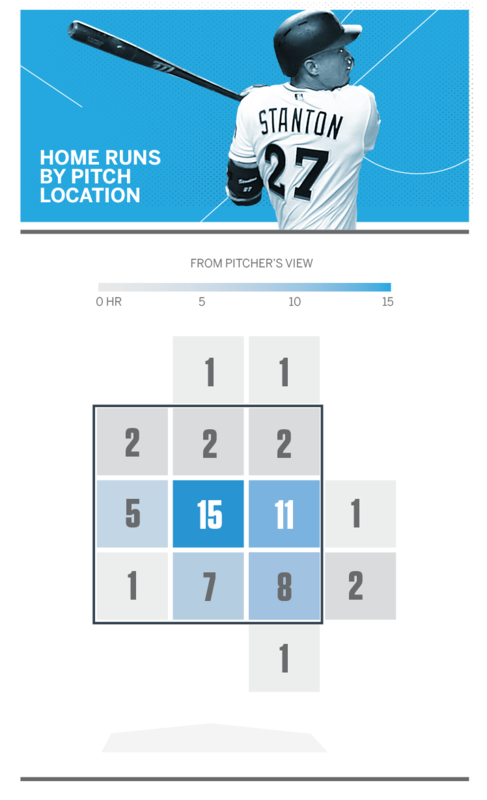 Stanton has hit a homer on every count -- with 1-1 being the most frequent, at 12 -- except one. He hasn't hit an 0-2 dinger this season. That second-half exit velocity is a tick above his season total of 109.3 mph, which is 6 mph faster than the major league average. He also outpaces the average distance (418 feet to 400), but his average launch angle of 25.9 degrees is a full 2 degrees less than the league average of 28.1. Stanton's homers don't leave much time for oohing and aahing, but they do leave -- and quickly.